The ignition of magic can happen almost at any time, almost anywhere. If magic doesn’t take place at a wedding ceremony, then something was planned out incorrectly. In this post, we will be discussing one of the most magical and the most romantic weddings that took place at The Omni Royal. The Omni Royal is a wondrous place to plan any of your major life changing events. Many people tend to enjoy the style, design and the luxurious theme that has been associated with the entire infrastructure. 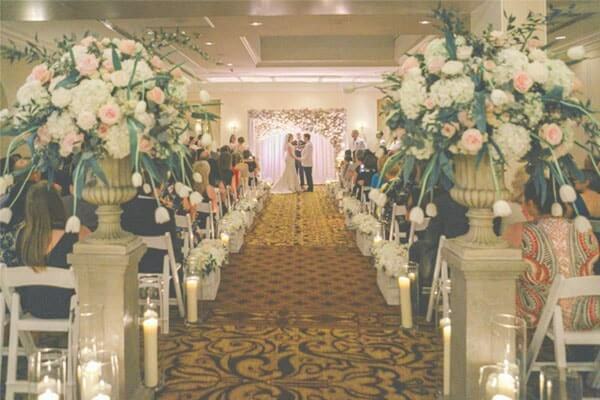 A recent story, compiled by Nola Flora, highlights their magical experience at the Omni Royal. The story describes a wedding ceremony of a daughter who comes from a florist background. The lucky young and beautiful bride named “Holly,” had preplanned her idea of what elements she was looking for during her big day, but since Debbie (Holy’s Mom) is a florist professional and owns the Nola Flora, who happens to be a professional in floral wall creations and designs. Although Holly had come from a florist background and has nearly been around flower décor all her life, she still had decided to leave the magic works to be forged and summoned by her mom, Debbie. “The flowers were always going to be a focus in my wedding since I come from a family of florists, “Holly says. “I left a lot of this planning to my mother and the amazing team at Nola Flora. I gave them a vague idea of what I wanted, and they created floral masterpieces” Holly had the opportunity to carry a hand-tied bouquet of white hydrangea with Alabaster garden roses, white freesia, Clooney ranunculus in white and accents of greenery. The bridesmaids carried hand-tied bouquets of green hydrangea, Kiera garden roses in soft pink, O’Hare garden roses and white freesia… Integration of metallic colors was enhanced with elements that surrounded the reception and the witness setting area. “I love rose gold, and my ring is rose gold, so a lot of the colors were centered on that,” Holy says. Cascading flowers was enriched around a cake for decors and it’s was visible and attention drawing when witnesses and guests walked into the room. Debbie and the team of designers further designed and implemented one of the most breathtaking pieces of all times, which is the receptions floral wall back dropping. Constructed with hydrangea with 3 large silver snowballs holders and a large snowball of hot pink and medium pink and light pink dianthus. Furthermore, decoration of floral decors has been installed on the doors and window frames throughout the entire Omni. If you are considering to have a wondrous and a memorable time of your life, than consider to have a wedding just like Holly & Steven did!